From Goodreads: In the real world, when you vanish into thin air for a week, people tend to notice. 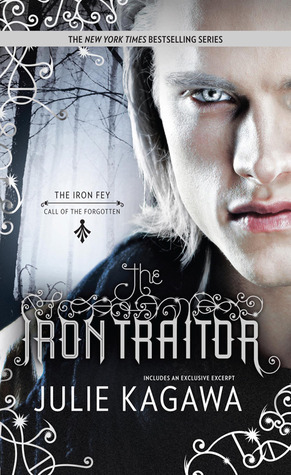 This is another fantastic novel in the Iron Fey spin off series, and I must say, it’s utterly perfect. Kagawa has a way with words and her storyline is enticing, energetic, and breathtaking all at once. Of course, she leaves us with a rather awful cliffhanger that will have readers biting their nails and dying to know what happens next, especially as it seems the prophecy is about to swallow all those we’ve come to love. I was floored by this novel—it was absolutely wonderful! From the characters to the plot and all that came in between, Kagawa’s world is stunning and almost makes me wish it were real—though I’m not really sure I’d want to be surrounded by the fey, if you know what I mean. Ethan Chase once again finds himself on the wrong side of reality, trekking through the fey underworlds in order to try and locate and save his nephew, Keirran, as Keirran defies all those around him in attempts to save his beloved. The twists are even more sinister in this novel, especially as Keirran refuses to listen to logic and is set on doing things his way, regardless of the cost to those around him. There are some jaw dropping scenes, especially toward the end as it all comes to a head, and I just adored it, even though it’ll be another year until I can find out what’s next for Ethan and Keirran, because right now, things aren’t looking up. Five stars. Harlequin Teen has been extremely gracious in allowing me to read an ARC of this novel prior to its release on October 29, 2013.